Bright colors highlights motor perceptual soft climberAges: 9 months to 3 years69 in. L x 68 in. W x 18 in. H Play is a child’s most important work and The Children’s Factory continues to be the World Leader in Soft Play. My son enjoys this very much as he loves to climb things. It’s very safe and sturdy while being attached by velcro. I place this over my son’s Dwinguler Eco-friendly Kids Play Mat and he goes to play on it without getting hurt. he can rough around and fall without a hard surface to endure. Very well made and sturdy as with all Children’s Factory’s soft play items. I love this because not only does this tunnel climber have play power but educational power as well. 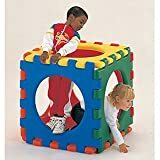 It helps infants/toddlers with their gross motor skills, spatial relations, colors, and shapes. Great for its value and longevity!